In this article, we reintroduce closures by building a tiny clone of React Hooks. 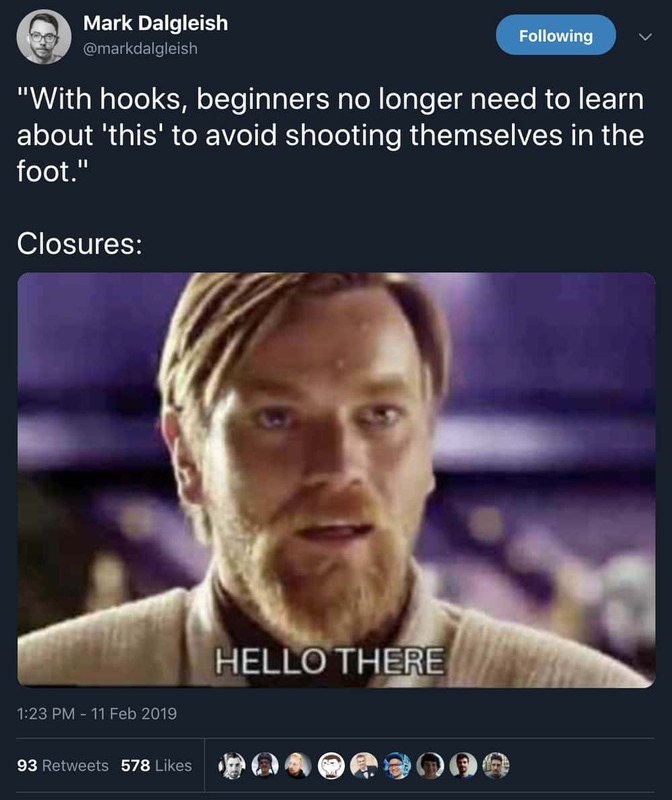 This will serve two purposes – to demonstrate the effective use of closures, and to show how you can build a Hooks clone in just 29 lines of readable JS. Finally, we arrive at how Custom Hooks naturally arise. ⚠️ Note: You don’t need to do any of this in order to understand Hooks. It might just help your JS fundamentals if you go through this exercise. Don’t worry, it’s not that hard! Here, we’re creating a primitive clone of React’s useState hook. In our function, there are 2 inner functions, state and setState. state returns a local variable _val defined above and setState sets the local variable to the parameter passed into it (i.e. newVal). Our implementation of state here is a getter function, which isn’t ideal, but we’ll fix that in a bit. What’s important is that with foo and setFoo, we are able to access and manipulate (a.k.a. “close over”) the internal variable _val. They retain access to useState ‘s scope, and that reference is called closure. In the context of React and other frameworks, this looks like state, and that’s exactly what it is. If you’d like deeper dives on closure, I recommend reading MDN, YDKJS, and DailyJS on the topic, but if you understood the code sample above, you have everything you need. Let’s apply our newly minted useState clone in a familiar looking setting. We’ll make a Counter component! Here, instead of rendering to the DOM, we’ve opted to just console.log out our state. We’re also exposing a programmatic API for our Counter so we can run it in a script instead of attaching an event handler. With this design we are able to simulate our component rendering and reacting to user actions. While this works, calling a getter to access state isn’t quite the API for the real React.useState hook. Let’s fix that. // Example 0, revisited - this is BUGGY! console.log(foo) // logs 0 - oops!! This is one form of the Stale Closure problem. When we destructured foo from the output of useState, it refers to the _val as of the initial useState call… and never changes again! This is not what we want; we generally need our component state to reflect the current state, while being just a variable instead of a function call! The two goals seem diametrically opposed. Now this looks a lot more like React with Hooks! You can read more about the Module pattern and closures in YDKJS. So far, we’ve covered useState, which is the first basic React Hook. The next most important hook is useEffect. Unlike setState , useEffect executes asynchronously, which means more opportunity for running into closure problems. To track dependencies (since useEffect reruns when dependencies change), we introduce another variable to track _deps. currentHook = 0 // array of hooks, and an iterator! const setStateHookIndex = currentHook // for setState's closure! const [text, setText] = MyReact.useState('foo') // 2nd state hook! So the basic intuition is having an array of hooks and an index that just increments as each hook is called and reset as the component is rendered. This truly underlies how “not magic” hooks are – Custom Hooks simply fall out of the primitives provided by the framework – whether it is React, or the tiny clone we’ve been building. Note that from here you can trivially understand the first of the Rules of Hooks: Only Call Hooks at the Top Level. We have explicitly modeled React’s reliance on call order with our currentHook variable. You can read through the entirety of the rule’s explanation with our implementation in mind and fully understand everything going on. At this point we have probably stretched the exercise as far as it can go. You can try implementing useRef as a one-liner, or making the render function actually take JSX and mount to the DOM, or a million other important details we have omitted in this tiny 28-line React Hooks clone. But hopefully you have gained some experience using closures in context, and gained a useful mental model demystifying how React Hooks work. I’d like to thank Dan Abramov and Divya Sasidharan for reviewing early drafts of this eassay and improving it with their valuable feedback. All remaining errors are mine..